I mentioned this before when we took Sarah to Disney on her first birthday but I am incredibly lucky to have a fantastic Aunt Sarah who works for Disney and is generous enough to share her Cast Admission pass with us. That's why 2 weeks before my birthday I can suddenly say to my husband, "I want to go to Disney with Sarah and my best friend" and he can say, "Ok, call your Aunt and see if it's alright with her." So I did. And she said it was ok. And then I was bragging to my mom and she said, "I want to go." So I said "Great! Let's do it!" And the whirlwind trip was planned on a whim and was a TON of fun. It was exactly how I wanted to kick off my last year in my 20s. Disney vacations are definitely not relaxing but being there just makes me happy and seeing the joy on Sarah (and Cam's) face made the 13 hour (16 with stops) drive done in one day worth it. 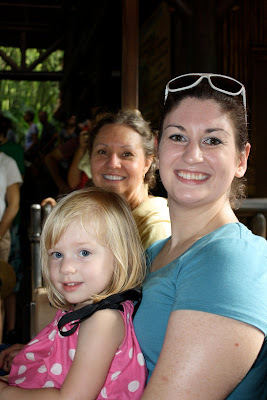 The first park we descended on was Animal Kingdom. And we had to get there early because I firmly believe the only way to do Disney is to open the park. You gotta get in there and get to the main ride or rides you want to do and get them done before the lines get ridiculous. It is not uncommon for rides at Disney to be 60 to 90 minutes, especially for the really popular rides like roller coasters. When we got there we were really surprised they were letting people into the park early. But they were just holding everyone up near the tree. So we took that opportunity to snap a quick picture with the tree of life in the background. Then it was time to execute my opening plan. I sent Mom and Cam with Sarah to go get in line for Expedition Everest and I boogied over to the Safari to get a fast pass. I met back up with them in time to get Sarah out of line and grab a parent share pass. (I love that Disney does that for parents with young kids!) Then Sarah and I hung out and played while we waited for Mom and Cam to get done riding the "train" as Sarah called it. We actually happened to be in the right place at the right time and were able to see Grandma and Cam come down the mountain, hands up in the air and screaming like fools. Then courtesy of the Parent Share Pass, Grandma took Sarah to play while Cam and I hopped right onto the ride. Awesome! I love roller coasters and Expedition Everest is a good one. It's got a nice surprise (spoiler alert) where halfway through the ride they send you backwards down a different track. After we got the coaster out of system I didn't really have a go-go-go plan for Animal Kingdom and took it at a leisurely pace (though others would disagree). I just wanted to make sure we saw some shows Sarah would enjoy and met some characters. 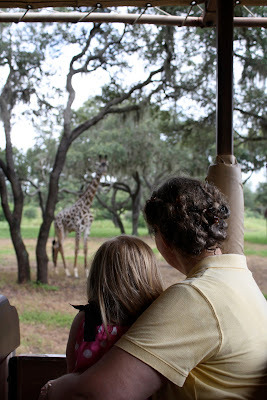 As we headed over to the Safari we saw some drums and let Sarah out to play. I'm sure they have some street performers who put on a show with them throughout the day. But I thought it was really nice they have them set out in the park for kids to play on. Sarah loved it! The safari was a really good ride! I've done it before and wasn't that impressed but this morning there were a lot of animals out and close to the road. Plus they dropped the stupid plot they use to have in the ride where you helped chase down poachers. I didn't like that because you wound up speeding through various parts of the ride and not able to really see the animals. 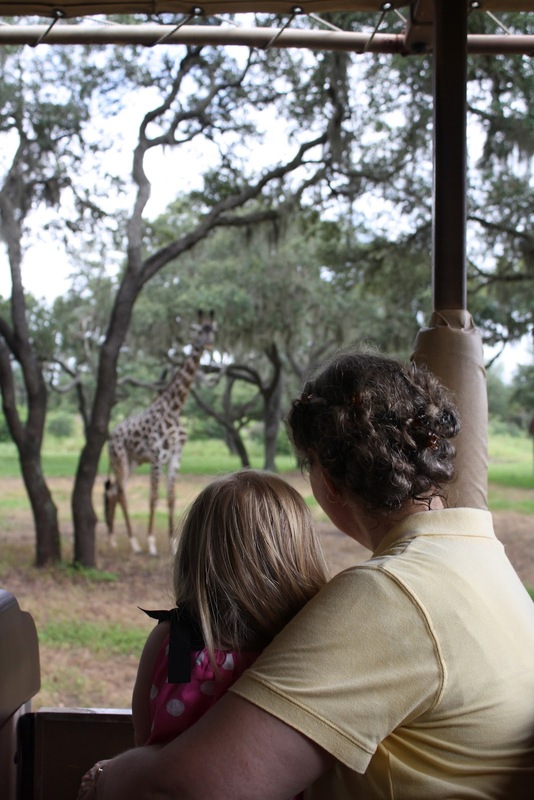 Grandma, Auntie Cam, and Sarah on the Safari ride. Admiring how close the giraffes were to the car. Both Sarah and I love giraffes. So not really having a game plan next we headed over to Camp Minnie Mickey. I really like how Disney has set places where characters are all day. They just keep switching them out for new people. It makes it so much easier to get good pictures and autographs. In Animal Kingdom they have different characters in these cute little huts. The first ones up where Chip and Dale. I was a little worried about how Sarah was going to do with these big headed characters. It can be a little overwhelming. But she did great! 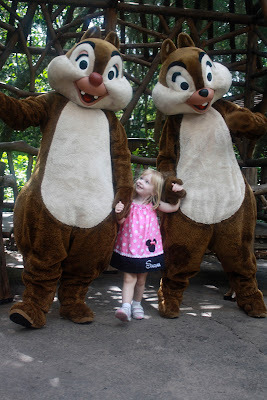 And Chip and Dale were just wonderful! I think they may get a post of their own because they had so much personality and I have a ton of pictures of just them that I want to show off. On the way to the next hut one of the street performers was out. His name was Guitar Dan and his job was to sing random songs about people in the park. Since Sarah is so darn cute and her name was clearly labeled on her outfit Guitar Dan stopped us so he could sing a song about Sarah from Tennessee who loves to dance. It was so cute! Sarah had a huge smile on her face the whole time. I wish I had thought to get my cell phone out to record it but I'm not that cool. I really don't take a lot of pictures with my cell phone so I don't think about that kind of thing. I need to get instagram apparently. My favorite character picture so far! Sarah was very excited to meet Donald Duck. She gave him a huge hug. But sometimes Sarah leans into hugs too much and can knock you off balance if you are perched. She's knocked Chris and I over many times. And well, Donald Duck is now a victim of a Sarah hug. He sold it though and acted like he was knocked over by her love for him, clutching at his heart as he went down. Then Sarah "helped" pull Donald back up. Of course we had to meet Minnie Mouse who was nice enough to personalize her autograph card for Sarah. 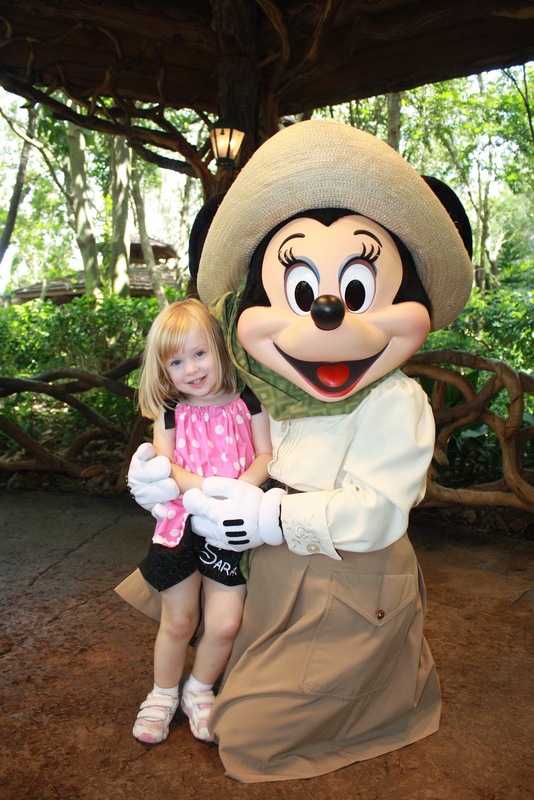 I'm telling you, if you go to Disney clearly label your child. It makes the place so much more special. A lot of cast members would talk to Sarah calling her by name. Face characters that can speak called her by name. Minnie wrote Sarah a nice note on her autograph card. I love it! Then we got really lucky. While Cam was holding our place in Mickey's line, Grandma and I saw Pocahontas pop up. She's a rare character so I grabbed Sarah and Cam and headed over to met her. At first Sarah was pretty upset with me because she knew she was in line to meet Mickey. 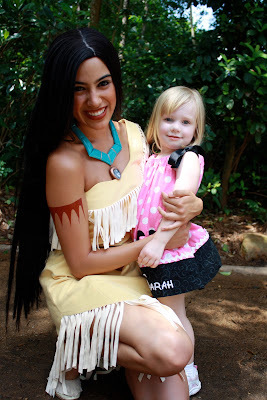 But she soon got over it and had a great conversation with Pocahontas. They talked about her necklace and shoes, 2 of Sarah's favorite things. Then it was back in line to meet the Mouse. After we spent a good amount of time hanging out with all the characters in Camp Minnie Mickey it was time to grab some lunch and discuss plans for the rest of the day. We talked about going to the Nemo show but I thought Sarah would enjoy the Festival of the Lion King more. One of the cast members at the park suggested the 3:30 show. She said it was the least busy since the parade was going on then. So that's what we decided we'd shoot for and then plan on leaving. I really wanted to be done at Animal Kingdom by 5 since we all had a really early day the next day. So while we waited we decided to head over to the Dinosaur part of the park to ride the kiddie ride and Fast Pass the Dinosaur time travel ride (I can't remember its name). I also thought Sarah would enjoy playing in the Bone Yard (playground and fossil dig area). On the way there we were side tracked by some more characters. Doug from the movie Up was out and didn't have a line so Sarah got to meet him. She was excited until we got up close to him then she freaked out a little. So I showed her how he likes to be scratched behind his ears and she warmed up to him. After he got done taking pictures with us Doug went to go find Russell. And sure enough next time we passed by both of them were out there meeting and greeting people. Then we saw some random cast member standing near a very unnoticable walk way and there was a sign that said something like Character Spot. So I asked who was down there and when they told us Pooh and Friends we decided to head on down. It was definitely a good choice. As soon as Sarah saw them she just lit up and exclaimed, "Oh look! There are my friends!" And she tried to sing the Winnie the Pooh song. We think Sarah may have realized there was a person inside Eeyore because she kept getting under his nose and looking into his mouth. 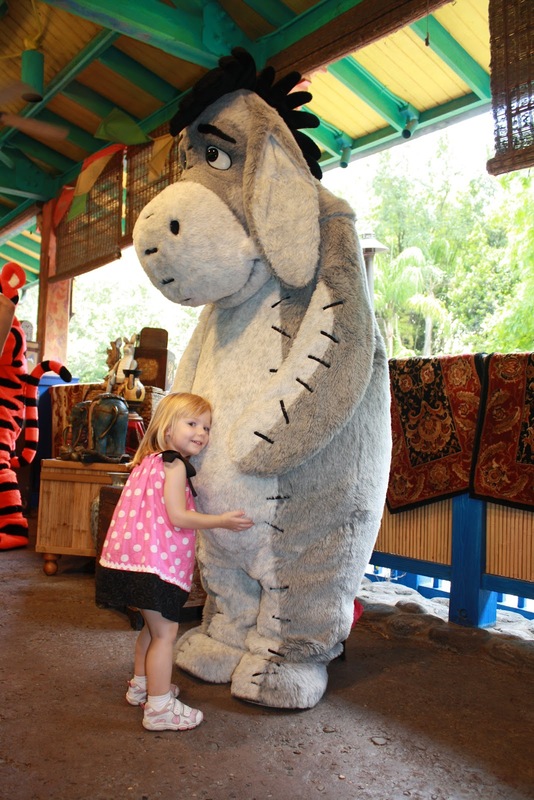 But it didn't faze her because she still gave him lots of love and was quite convinced that, "Eeyore was really happy to see me." Tigger was great and definitely full of bounce. Sarah giggled as she bounced with him. As we were heading over to Dinoland Aunt Sarah got a hold of us. She had just gotten off work so she joined us for a turn on Triceratops Spin. And offered to take Sarah over to play in the Bone Yard while we attempted to ride the Time travel ride. (It broke just as it was our turn to enter the Fast Pass line). But that worked out for the best because we were able to get over to the Lion King show and get good seats. And we were able to use our Fast Passes after the show when the ride was working again. We did a little window shopping on the way out of the park and headed home for a home cooked meal, showers for everyone, and a decent bed time. 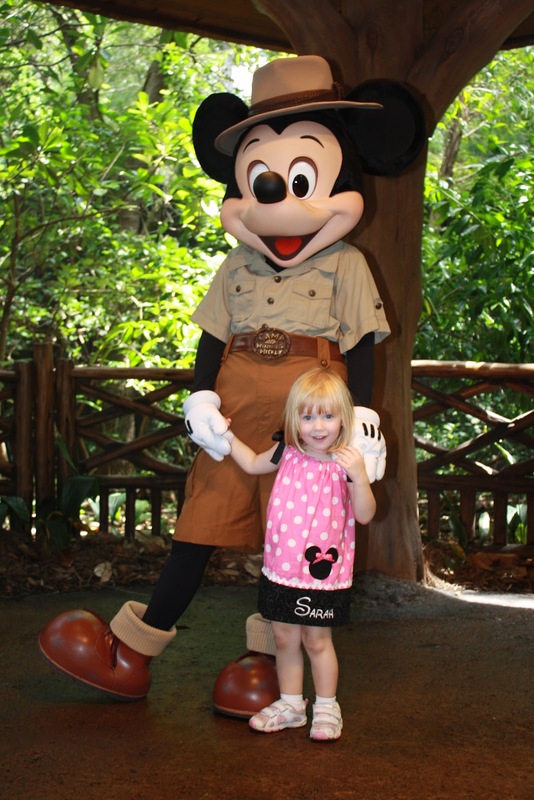 Sarah did a great job at the Animal Kingdom. It was the first of many long, hot days with no naps but she was a trooper and had a great time. I know we spent most of the time meeting characters but it was worth it. She had so much fun giving them hugs and kisses. 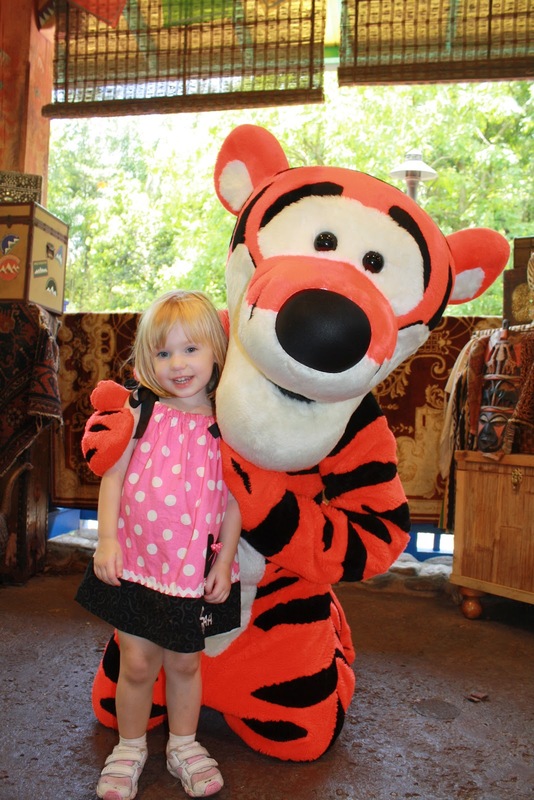 I think the only thing I did wrong at the Animal Kingdom was I took her to the 4-D show It's Tough to be a Bug and it was a bit intense for her. We happened to be sitting right next to where Hopper appears and it scared the mess out of her. I think that should have been skipped and then we might have been able to take the train out to the petting zoo. But who knows. There was more stuff to do then we had time for. (That's always true for every park.) And we probably could have stayed later but I didn't want to burn Sarah out on the first day there. So we've just saved some stuff to do next time.